Discussion Meeting is Wednesday, February 14th, at 12:00pm in the Community Room. “In all ways a great novel, a nonstop pleasure brimming with charm, personal wisdom, and philosophic insight.this book more than fulfills the promise of Towles’ stylish debut, Rules of Civility.” – Kirkus Reviews (starred) From the New York Times bestselling author of Rules of Civility–a transporting novel about a man who is ordered to spend the rest of his life inside a luxury hotel With his breakout debut novel, Rules of Civility, Amor Towles established himself as a master of absorbing, sophisticated fiction, bringing late 1930s Manhattan to life with splendid atmosphere and a flawless command of style. 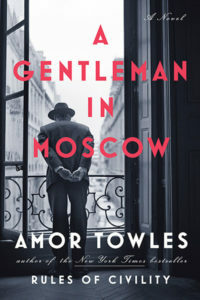 Readers and critics were enchanted; as NPR commented, “Towles writes with grace and verve about the mores and manners of a society on the cusp of radical change.” A Gentleman in Moscow immerses us in another elegantly drawn era with the story of Count Alexander Rostov. When, in 1922, he is deemed an unrepentant aristocrat by a Bolshevik tribunal, the count is sentenced to house arrest in the Metropol, a grand hotel across the street from the Kremlin. Rostov, an indomitable man of erudition and wit, has never worked a day in his life, and must now live in an attic room while some of the most tumultuous decades in Russian history are unfolding outside the hotel’s doors. Unexpectedly, his reduced circumstances provide him a doorway into a much larger world of emotional discovery. Brimming with humor, a glittering cast of characters, and one beautifully rendered scene after another, this singular novel casts a spell as it relates the count’s endeavor to gain a deeper understanding of what it means to be a man of purpose”– Provided by publisher.